Parts 1-3 of this series can be accessed here. This is Part 4. If the previous episode of losing/ misplacing minutes of a crucial meeting was an instance of a regulatory misdemeanor, this episode details another shocking omission on part of Ramesh Abhishek. He could plumb new depths for obeying His Master’s Voice. Between him and a few other Babus, jointly referred to as the C-Company, Chidambaram (PC) could make or break any industry segment or a hardworking entrepreneur. That his destruction would result in loss of a million jobs an ecosystem was creating on its own, was also killed, reeks of hypocrisy of the highest order. What therefore is surprising is that despite having a mountain of evidence on all players of the NSEL episode, Ramesh Abhishek chose to train his guns only on Jignesh Shah. To add insult to injury, this bunch of blundering blatherers is now drumming up chants of unemployment in the current regime. That the economy grew when they (UPA) were in power is more a case of a rising tide lifting all boats than their effort. The former Finance Minister’s popularity across political parties is perhaps more due to his devious ways of devising money making using the markets (which he doubtlessly shared among the coalition partners) than his track record of which the less said, the better. But I digress. Back to FMC. 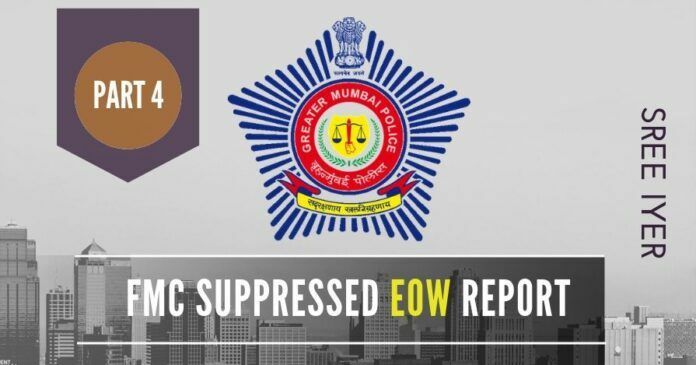 The issue in question is the suppressing or not divulging an important investigation report of Rajvardhan Sinha, Additional Commissioner of Police, Economic Offences Wing (EOW). 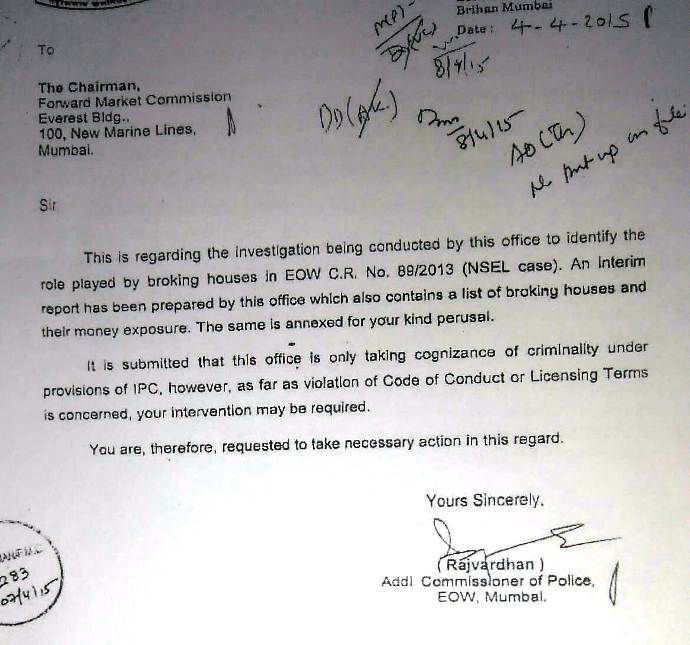 On April 4, 2015, Rajvardhan sent a report to Ramesh Abhishek, on the role played by brokers in the National Spot Exchange Limited (NSEL) scam. While submitting the interim report, he mentioned that his office is only taking cognizance of the criminality involved, and suggests that Ramesh Abhishek should intervene in regard to assessing the violation of the code of conduct and licensing terms as relevant to brokers. For more see Figure 1. In essence, what he was saying while sending the interim report is to check whether what the brokers have done is consistent with their terms of license given to them and market conduct expected from them. Ramesh Abhishek was always found to evade regulatory responsibility (see earlier posts) on one excuse or another. This instance further reinforces the fact that it is not a lack of power or information that he always used to cite for his inaction, but deliberate and diabolic intention to divert the real issues. This is just a short list – I can list several more. EOW wanted Ramesh Abhishek to look into other aspects of malfeasance. What therefore is surprising is that despite having a mountain of evidence on all players of the NSEL episode, Ramesh Abhishek chose to train his guns only on Jignesh Shah. Was it because Shah was threatening to unseat the cozy club of C-Company run NSE? What transpired confirms this view. The regulatory conduct of Ramesh Abhishek, if found as a violation when he seemed to have lost or missed preserving the minutes of the meeting (Part 3), will look like a diabolic plan and deliberate attempt to suppress the investigation report and divert the process of proper investigation. Which officer, in a high position of regulation, in the midst of major crisis will deliberately overlook an important investigation report? Is it due to the very fact that the crisis is of his making, with a motive and malign objective, that made him conceal and suppress the report? Will the government look the other way if a responsible officer wantonly creates a crisis like situation and then tries to complicate it by concealing reports of vital investigations and begin to harass genuine and hardworking entrepreneurs? Next articleNewsX poll findings – Ram Mandir not an issue? Ramesh Abhishek is known to be one of the most not-so-straight IAS officer. Interestingly, this article (https://prime.economictimes.indiatimes.com/news/68766159/corporate-governance/ramesh-abhishek-who-got-india-a-boost-in-ease-of-doing-business-has-been-put-in-the-dock-heres-why-the-charges-are-untenable-?utm_source=https://economictimes.indiatimes.com&utm_medium=dailynewsletter&utm_campaign=ETprimedistribution&ncode=b2f07bc067691d5c) doesn’t highlight his political connections and benefits provided to his kith and kin. His co-brother LK Agrawal and Indian Revenue Service officer has hoarded properties for himself and on RA’s behalf. A deeper search into his conduct will reveal how in his last few years of service, he has accumulated wealth and connections with Mumbai based businessmen and brokers – some of them have even funded his family’s luxury trips. He’s a master power-player, who was close earlier to P Chidambaram and immediately after change of government, took a posting away from the limelight at Cabinet Secretariat and from thereon played his cards with BJP government to become their favourite.